Chicago Review Press, 9781641600477, 240pp. Viking Age Brew brings beer history alive and takes readers on a lavishly illustrated tour of rustic brewhouses fueled by wood and passion. Sahti is a Nordic farmhouse ale that is still crafted in accordance with ancient traditions dating back to early medieval times and the Viking Age. Sahti is often thought of as a freak among beer styles, but this book demonstrates that a thousand years ago such ales were the norm in northern Europe, before the modern-style hopped beer we drink today reached the masses. Viking Age Brew is the first English-language book to describe the tradition, history and hands-on brewing of this ale. 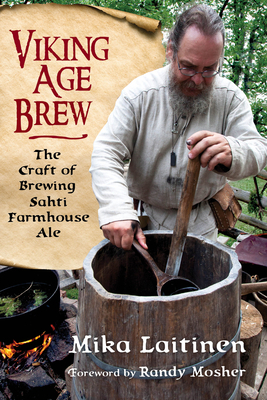 Whether you are a brewing virgin or an experienced brewer, the book unlocks the doors to brewing sahti and other ancient ales from medieval times and the Viking Age. Mika Laitinen lives in Finland close to traditional sahti brewers and has coauthored two books, one about sahti and one about homebrewing, in Finnish. His articles on sahti have appeared in several beer magazines, including Brew Your Own,and he writes about local Nordic beer culture on his website Brewing Nordic (www.brewingnordic.com). Randy Mosher is the author of Tasting Beer, Radical Brewing, Mastering Homebrew, A Beer for All Seasons, and The Brewer's Companion. He lives in Chicago, Illinois.